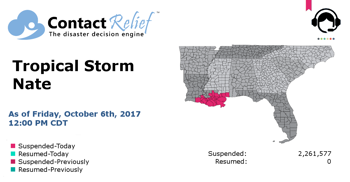 ContactRelief recommends resuming contact with all consumers except those in the Mobile, Alabama area. 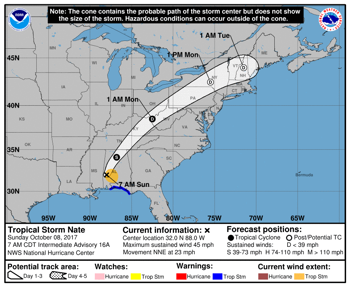 Hurricane Nate Makes Landfall - Now a Tropical Storm. Hurricane Nate makes landfalls in Louisiana and Mississippi with storm surge driven flooding in some coastal areas. 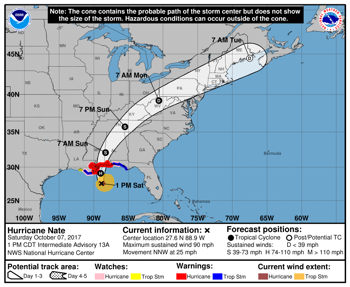 Hurricane Nate makes landfall near the mouth of the Mississippi River. 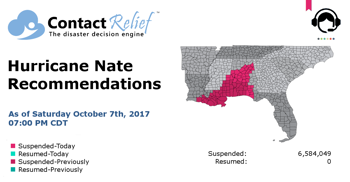 Hurricane Nate, racing towards Louisiana, expected to be a Category 2 storm by landfall. 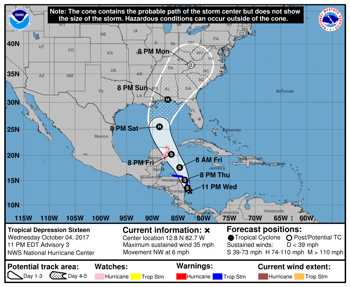 Hurricane Nate Speeds Across the Gulf Of Mexico Towards the U.S.
Now Category 1 Hurricane Nate may intesify slightly before making landfall Saturday night. 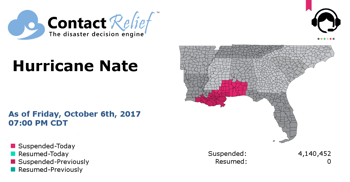 Tropical Storm Nate will intensify to hurricane strength as it moves through the Gulf Of Mexico towards the Louisiana coastline. Tropical Depression 16 track shifts westward directly threatening Louisiana, Mississippi, Alabama, and Florida. 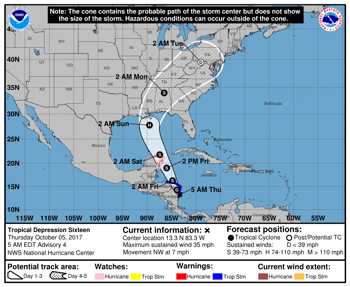 Tropical Depression 16 forecasted to grow to hurricane strength and strike Gulf Coast on Sunday, October 8th. Looking ahead to this winter! 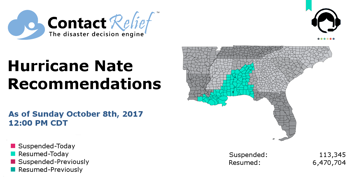 ContactRelief Consulting Meteorologist Dr. Kevin Levey looks at the long-range precipitation forecast for the upcoming winter season.